Through funding from the Ohio Environmental Education Fund, the Federal Valley Watershed Group and Rural Action Sustainable Forestry (RASA) are offering free on-site visits for forest landowners in the Federal Valley area of Athens, Morgan and Washington Counties. Experienced foresters, as well as a ginseng and medicinal herb specialist, are available to walk your property and share their knowledge and advice according to your individual needs and goals as a landowner. If you are interested in learning about timber value, tree identification, forest management or profitable forest herb production, this is an opportunity to take advantage of. You can also learn about federal programs and local tax incentives that could save you money, as well as help you improve your environment. It should also be noted that these land assessments are completely confidential. Visits will include a written report and educational materials designed to help you meet the specific goals that you may have for your land. This service is available on a first come, first served basis – so contact us today! 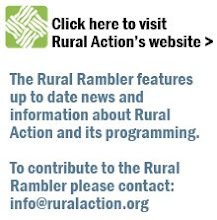 Contact Tom Redfern or Rose Roe for more information (740.767.4938), or email (tomr@ruralaction.org) or (susi@ruralaction.org) for more information.